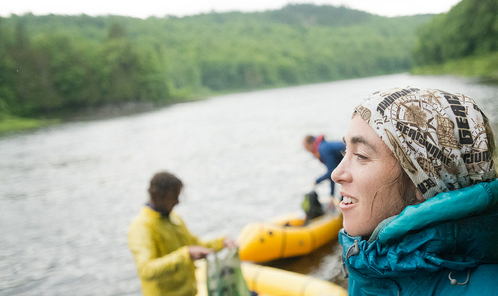 Chelsey Magness sporting her GearJunkie buff in Untamed New England, summer 2012. Chelsey Magness, team GearJunkie.com/Yogaslackers pint-sized bundle of fury, is heading out from her home in Bend, Oregon, to participate in END-TOMBED. She may be small, but she's not only gunning for the zombie women's podium, but the overall podium too. GearJunkie.com is getting behind Chelsey by offering a custom GearJunkie Buff for any racer that can keep up with her for the whole 12 hours. Nothing like racing with a big old target on your back, right Chels? 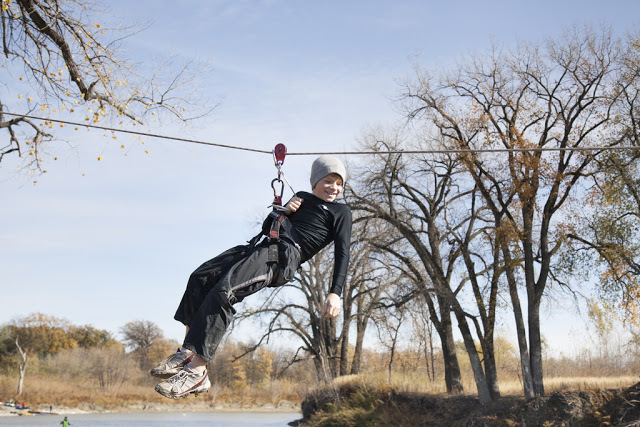 Extreme North Dakota Racing, in conjunction with Ground UP adventures, hosted the first annual Family Adventure Race (END-FAR) this past weekend. 45 kids aged 3-16 and about 20 adults came out to navigate to 18 checkpoints by foot, bike, a variety of watercraft, and even zip line! It was an awesome day and a big thanks go out to all the volunteers, the sponsors (Dakota Harvest Bakery, Ski and Bike shop, Cherry Berry, and the Grand Forks YMCA), and all the youth racers and their families that made the event a resounding success. Check out ENDracing photographer Wes Peck's photos and a great little video put together by Ted Bibby to get a glimpse of the action. 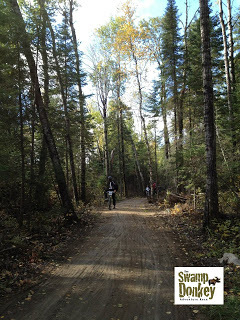 The Swamp Donkey Adventure Race is a 9 hour event put on by our friends (Swamp Donkey Adventure Racing) north of the border. They've been putting on the event for six years now and it has grown to become the largest adventure race that i've ever attended or even heard of - with 113 3 person teams coming out to brave the cold and wet conditions last saturday. 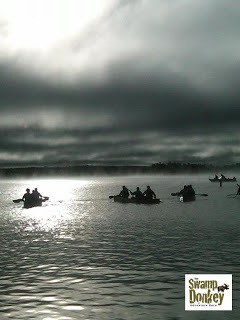 The race started at 9 am with a paddle on Falcon lake (if you've never seen a mass race start with over 100+ canoes it is a sight to behold!). Team ENDracing (comprised of Joel Larson, Tammy Magness, and myself, Andy) had been talking a big game on Swamp Donkey's Facebook page and so we reckoned we'd better try and back it up. We pushed hard right from the start and had a great paddle leg, coming off the water in 6th position. Moderate winds, steam rising from the water, and near freezing air temps had made the paddle pretty epic - three teams ended up capsizing! The paddle was followed by a bike orienteering leg. We took a while to warm up but navigated pretty well, despite a confusing trail network. The trails themselves were fantastic, but punishing for poor joel who was riding a rigid framed bike and couldn't manage to ride any of the more technical rocky sections. He took a couple bad falls when he was unable to unclip from his pedals (novice adventure racers take heed - get pedals with a mud clearing design for AR... spd style cleats are no good!!) and a fun slide down 'the ramp' but managed to recover and keep pushing. Finally we got all the Orienteering points and settled in for a longish ride on physically demanding trails of wet sand. Tammy led the charge and i tried to tow joel on the sloppy mess with little success. At this point we were in first place in the coed category and felt like hunted animals. We finally hit pavement and settled into what we thought was a fast pace line. It wasn't. Another coed team blew by us like we were standing still, gaining a full five minutes on us by the time we got to the end of the bike, only a couple of miles away. The next section was a foot orienteering section that started with a 1.5 mile trail run. In her element, Tammy pushed the pace while Joel and i struggled to keep up. We caught the team that had passed us on the bike just as they headed out from the end of the trail into a swamp. This was our favorite part of the course - five points that required good navigation (not an easy feat with a 1:50000 scale map and 25 foot contour intervals!) through difficult terrain. We never stopped moving. One of the checkpoints proved difficult to find (for most teams) and cost us nearly an hour - but we kept our spirits up and didn't give up, or rely on information other teams provided ("we've already looked that way"), and finally figured out our mistakes. Coming out of the swamp we passed a manned checkpoint and knew we were in first place. it was our race to lose. The final bike section was super short and all pavement. we'd paid our dues i guess, and no one was close enough to catch us. Team ENDracing crossed the finish line after having cleared the course in roughly 7.5 hours, fifth or sixth place overall, and the first coed team. Woo Hoo! All in all it was a fantastic race - a great balance of good navigation, physical work, challenging terrain, and suffering (man that water was cold!). And we even got great wildlife sightings to boot - including 1 sasquatch and 1 alien. Hats off to Swamp Donkey Adventure Racing for putting on a great event, thanks to all the amazing volunteers that made it all possible, and congrats to to all the other teams that pushed themselves against a tough course and had their own epic adventures!